That the Industrial PhD student gets the tools to engage in academic and commercial environments and get the best of both. That the Industrial PhD student receives tools to translate own and other research into innovation and business value. That the PhD student acquires an understanding of his/her potential impact as a business researcher and the impact of the project in both an enterprise as well as social perspective and also is able to act in relation to it. That the Industrial PhD student creates a professional and social network with other Industrial PhD students. The course is rated to 5 ECTS credits and is mandatory for all approved Industrial PhD students. The course consists of three modules, the two modules 1 and 3 are compulsory for all, while each student chooses one of three electives at module 2. The student thus participates in three modules over a one-year period from the start of the Business PhD project. Two of the modules take place as residential seminars, where all students from the same team are gathered regardless of the choice of modules. 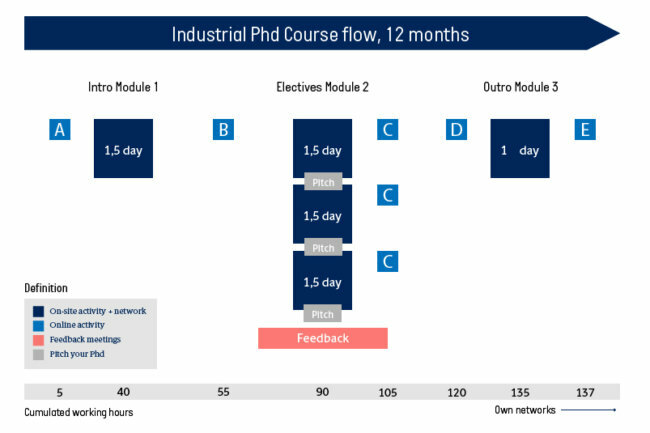 The Industrial PhD course and its content is designed for you, as a student, to follow at the start of your Industrial PhD education, and you will make the most of the course by participating early in your project. We therefore encourage you to sign up for the first coming course after your project start. The course will help you prepare for your role as Industrial PhD student and strengthen the special industrial researcher profile that you are about to develop. Please note that the course is only for Industrial PhD-students funded by Innovation Fund Denmark.